I thought Alienware was the only company that offered custom high performance PCs and Laptops, I guess I was wrong. 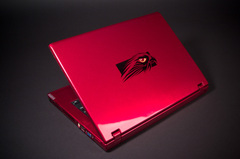 Falcon Northwest recently unleashed this Intel Core 2 Duo FragBook TLX 'Thin and light' series model. Less than an inch and a half thick, and weighing in at 7.5 pounds, it would make 'Houdini wonder how it was done.' Other features include a 17" Anti-glare WSXGA LCD with a 1680X1050 resolution, a NVIDIA GeForce Go 7600 256MB VRAM graphics processing unit (GPU), a built-in standard definition TV-tuner, and realtek Hi-Def built-in stereo speakers. More features here>> Ladies you can have it dipped in almost any color.